Rock the Kasbah, Marrakesh Morocco – Traveling Epic! Let’s go back in time… to a more simple time, with rich flavor, and a close knit community. Imagine the farmers near your home growing your food, you go to the market and find things that are both grown locally, but with no chemicals, and any meat you eat you can first look it in the eyes. Go back in time with me to Morocco, I’m you’re guide Joel of Arabia. 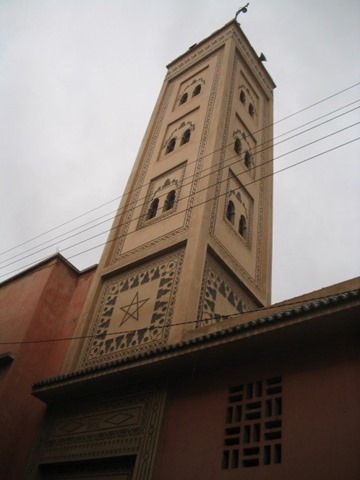 I also wrote up about travel in Fez another look at time travel back 2000 years. 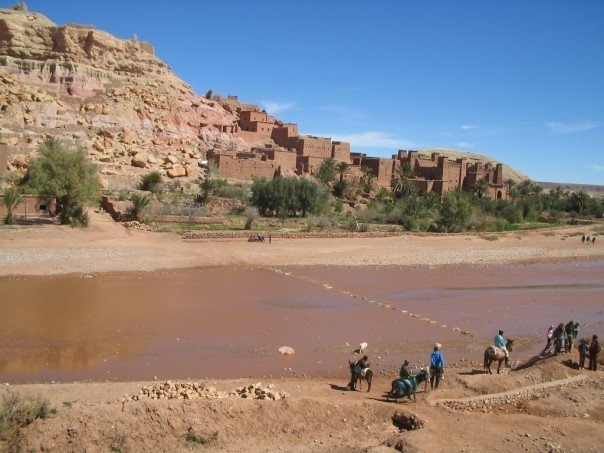 We rode donkeys across the river and helped a Berber trader write a post card to his friend. He’d been traveling across the Sahara for the last few weeks. One of the most fascinating things about Morocco is the fact that at times you definitely feel like you’re in another world completely. There are time warps you jump through as you see different parts of Morocco. 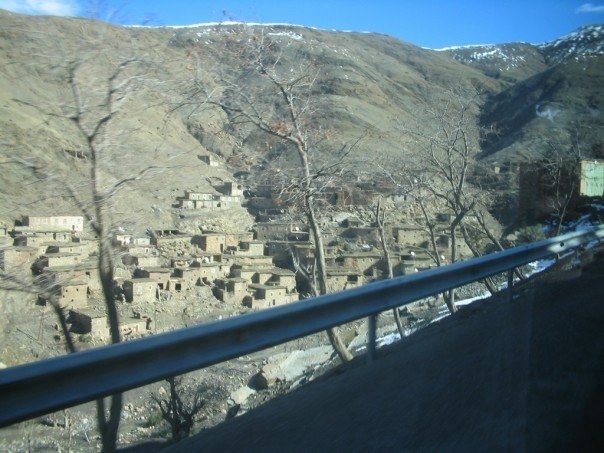 One place you must visit is the Atlas mountains. The people of the mountains live like they do in Tibet. They live off the land. They eat their animals. Life off the land despite the harsh conditions. They walk up crazy steep slopes along goat and sheep trails. This is the kind of place where if you visit a family, they may take a goat out and slaughter it for the meal in honor of your visit. The culture is rich, the people are fascinating, and their lives reflect our heritage and history of 1000s of years ago. What you expect to find in Jerusalem of the old way of doing things is in Morocco. Part of that reason is literally hundreds of Christian films use this area for their life of Christ movies including, Jesus of Nazareth (1977) and The Last Temptation of Christ (1988). An incredible day trip you MUST do is to visit the UNESCO world heritage site of kasbah-town of Aït Benhaddou. The city looks like it’s 2000 years old, and many of these buildings feel that old, and are built like they were. It was used as a backdrop for more than 20 films including Films such as The Mummy (1999), Gladiator (2000), Kingdom of Heaven (2005), and the recent Salmon Fishing in the Yemen (2011). One of the most important fortress strongholds on the old Salt Road where camel caravan traders brought slaves, gold, ivory and salt from Saharan Africa to Marrakech and beyond. You gotta get out of the city and you can really see amazing things on the trip over the mountain to Ouarzazate. Pronounced War-za-zot. These include trips to Zagora, an oasis town surrounded by palm tree plantations and a departure point for camel trains to Timbuktu, a journey that would take about 52 days. (Not yet recommended) Careful on multi country treks as the Algerian border is some times closed. Most would consider the 1 day, 3 day and 7 day caravan trips. The Berber people are from the desert. They are nomads. They trade and barter. Every Berber has things he wants to show you, and you are his guest. He’ll invite you in for some amazing and sweet mint tea. As his guest he will roll out his dozens of carpets, and show you his finest jewelry. It’s customary for him to show you everything, and you pick out various things you like, and then the bartering begins. It’s natural for it to start out high, and then as you negotiate, you can take things out and barter for the things you really really want. It seems like with me, I always win and they always tell me I’m a shrewd trader. After that, they make me feel at home and we exchange gifts. It’s good to bring something small from home that you can give to his wife, like makeup or perfume, or something for his kids. It’s a bit embarrassing when he gives you a gift and wonders if you have something for his wife. Be more prepared than I was. One strategy I’ve learned from berbers and taxi drivers around the world is they like to be right, but they want to make sure you’re happy. Learn that you don’t have to have the last say, and you’ll make your host a lot happier and you’ll get much better service even if you are a very shrewd trader. In Morocco it’s not unusual to get 70-80% off. I got some incredible massive fossils for about $20 and less. The prices often start in the 100-200 range. Something in the states that would cost me closer to $100. One thing you do learn is you don’t ask the price unless you really want the item. That often means, don’t ask unless you want to spent the next 10 minutes bartering. It’s not customary to just make one offer and walk away. They like the sit down and relax… you are my guest kind of bartering, not I’ll make you an offer and then walk away. You feel like you must be Lawrence of Arabia, or the Prince of Persia a couple more of the many films that was filmed here. 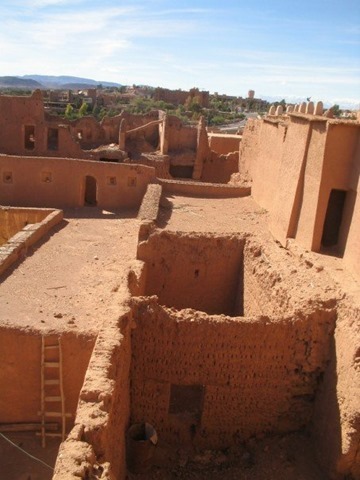 Be sure to wanted around Ouarzazate an important trading city on the edge of the Sahara desert. Get lost in the old Kasbah. I encourage you to get a variety. Across everywhere you’ll visit there are few shops with set prices, and even more rare in the villages. For food you don’t have to do bartering. If you’ve ever had Moroccan food in your life you’ve likely either eaten dates and finger food on large platters sitting on big cushions and relaxing to music. When the main dish comes out it’s smothered in amazing stewed carrots, zucchini, or egg plant including lamb, beef or chicken with the tender meat cooked in large clay pots over coos coos. This earthen method makes it all very tender. Incredible food. As we ate we watched to storks making a lot of noise in a massive nest. The city is made of the soil as well baked mud bricks… the pottery is everywhere. Pride in every bite. You can eat at a fine restaurant and spend $50 for amazing Moroccan food or spend $2 and pick the meat in skewers and sit under a tent near the square. As well, stop at a café for a an amazing meal. The salads are fantastic with fresh cucumbers, tomatoes, black and green olives and of course Oranges! An incredible Mediterranean meal. I hear you can even get camel meat. Andrew Zimmern style meals are within reach, but even without stretching your pallete, you can have some of the freshest, best food you’ve ever tasted. I seriously think we have a LOT to learn from the simple ways. 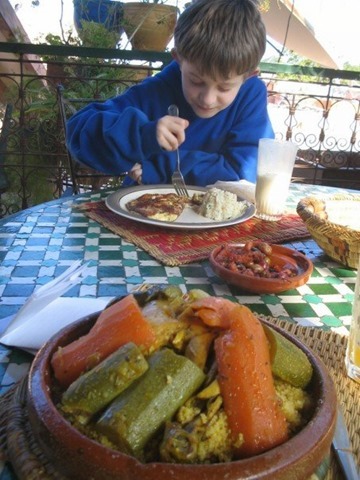 Our food has been messed up, and Marrakech and surrounding area and likely much of Morroco has got it right. Western Europe and the US is missing out. There are now restaurants who try to mimic this, that try to get back to eating local, but they may be missing elements. The owners would do well to spend some time in Morocco to learn what it is that makes the difference. There is something to be said of organic, locally grown, no chemicals, and that connection with the earth that’s in the oven, in the pots, and the open flame. Turkey, Bulgaria, Jordan, Lebanon, Egypt, Israel… there are others that have this figured out as well. 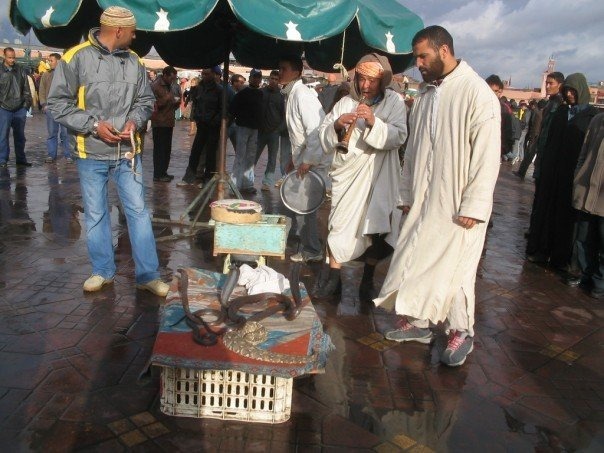 Djemma El Fna – Currently my favorite market in the world! I LOVE the town square of Marrakech. Before there was TV, Radios, Phones, and iPads. A thousand years ago, on the edge of civilization there was a mystical place. A place with story tellers, snake charmers, acrobats, fresh fruit juices made by hand with fruit from the trees in the town you were in. This place still exists! Every day after my trips around the city, I would end my day in this place. It was packed with locals. The best nuts and juice in the world is available for the taking. One amazing thing about Marrakech is the fresh smell of Orange. The trees that line the streets are Orange trees. I don’t know a city anywhere else where Orange trees are scattered throughout the city. It’s like Johnny Appleseed had a counterpart in Marrakech and all he did his whole life was plant Orange trees in this one city. While I’m sure it could make a mess in some cities here they gather them up and there is fresh orange juice anywhere you want. We paid 35 cents (.35 USD) for our glass of orange Juice. It continues to be the best glass of orange juice I’ve had in my life! The square is filled with locals listening to these stories and watching what’s going on. I wish I could be invisible and watch the goings on of that square. Instead, I walk up to see the crazy acrobat, similar to those “artists” who do tricks or play music in most large cities around the world and collect money, but I barely get a chance to see what the tricks are, and they are up in my face asking me for some money. Despite the fact that I’m happy to contribute a coin. I just visited an ATM and I have no change. No money no show, but wait I haven’t seen anything yet. Tip: bring small change, and expect for them to seem a little insulted, but really that’s just the whole bartering pattern. I’m sure if you gave them a dollar or more they’d be much happier, but maybe it doesn’t matter. The first answer is always to ask for more in that culture. Either way, I come back later with change, and I am fascinated by the diversity of what comes. It’s cool to see the cobras being charmed and then a harmless water snake strung around my neck without asking for it… Yes, I’ve seen a snake before, but I’m happy just watching you charm the Cobras. Really it is an amazing place, but there are surprises. You’ll see things here you won’t see anywhere else. Just like mimes that want money from you if you take there picture, there’s these very colorful characters I call the Water guys, who want the equivalent of a dollar/euro/pound for a picture. If you sneak a picture be really careful they don’t notice. I didn’t pay. One guy on the square is “the dentist.” He has his crude tools to pull out your tooth. Of course you go back a hundred years and a guy like this could come in handy. He’ll really take care of that aching tooth. He has a few hundred teeth to prove he really will do it. If you look at his collection of teeth pulling equipment and hear his story, you should contribute to the cause. As well, we came by the baths and water place. People come from all over to collect water to bring home. It reminds me of the lady by the well, in Christ’s time. People come water their animals, but also collect water for drinking. The homes really are for sleeping. 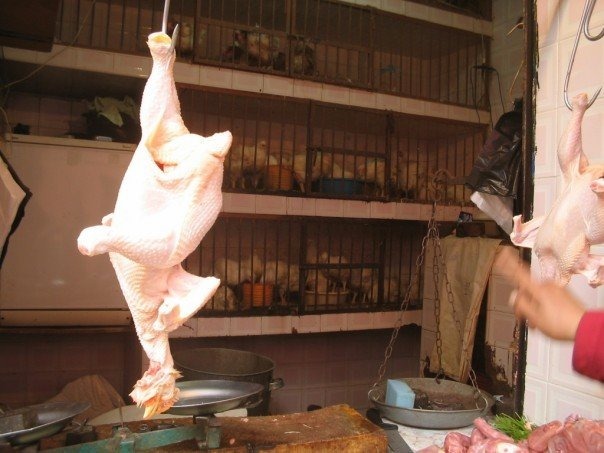 The entertainment is in the streets, why do you need a kitchen when you can get it all fresh and local? The people are simple, but it’s amazing to me the principles of life they live. They eat better than we do, they eat local, they eat food that has been gathered or grown within less than 20 miles of the city. As you wander the city don’t be afraid to slow down, and talk with the people. They want to talk to you. They are very interested in where you come from and how you are enjoying yourself. Slow down and enjoy the mint tea. There’s a fast pace of the city and there’s the slow pace of the desert. Both of these cultures clash to make Marrakech as rich as the dyes in the colors of the carpets. If you feel so inclined you can visit the place where they mix the dyes. Again a place that will take you back thousands of years. Lose yourself. That’s the goal. Go back in time. There are so many adventures to be had here. This is a place with a different pace, but also various modes of transportation. Getting off the plane at the Marrakech airport, we were rushed off in a taxi that seemed put together with bailing twine. You don’t just have to take taxis, in contrast to the western world where a carriage brings up memories of being a Prince and Princess. Here a carriage is a good alternative transport. There is no difference in price. They both can be negotiated with. When you slow your pace, you’ll definitely have to give it a shot. It’s an oldie, but goodie. The’s one story of Marrakech, that blows my mind, and my eyes. The Saadian tombs were build in the 16th century, and lost to the world. They were rediscovered in 1917 with a fly over. Can you believe that? A 15 minute walk from the town square and these tombs were simply walled off. The colored tiles are beautiful and intricate designs. Call to prayer echoing over the city, some westerners may be intimidated in this Arabian city. Personally I think the singing brings an element that helps remind me I’m not at home anymore. That’s a very good thing. Jews live side by side with Muslims. The locals tattoo themselves with their faith. The door handles and markings on the hundreds of year old doors in the old city. You can tell a lot about the people. Marrakech is an old capital city and center of a major trade route a very old trade route that would bring in goods from Africa and goods from across the desert. If you feel so inclined you can spend a week on a real desert excursion into the Sahara. Live with the Berbers, live like the Bedouin people. Camels are majestic animal. They meant the difference between death and survival in the desert. An animal that was built for the conditions. If you see a large group of camels. The people with them will give you a small ride for a price. There is actually very little difference in price for an hour ride and getting on for a picture. They’ll get you loaded up and walking and tell you the price doesn’t matter. It’s a good price for you. 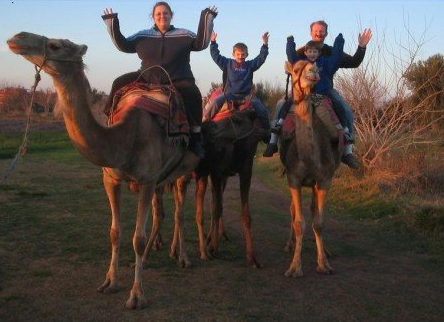 Travel Tip: Always always negotiate before you get on the camel’s back. It’s in their interest to have you think price doesn’t matter. Negotiating Similar to the carriage ride. They don’t know that you know that they are willing to take a local price. Sometimes it even helps to say… I don’t want tourist prices, I want local prices. The price will drop in half or more. For camels you can end up paying easily $50 USD if they get their first price. Instead be willing to walk away and you can get a good ride for $5. They’ve been standing out in the heat, they want something fair, and depending on the time of day and how business has been really impacts their willingness to accept various prices. Morocco, is one of the richest accessible and inaccessible place in the world. It’s a world of extremes. It’s the place of adventure. Just the name sparks imagination of a country of Muslims poorly portrayed in Babel. While I loved the scenes of Morocco in Babel, I fear the stereotypes create walls and prevent people from experiencing the richness that is so accessible. Morocco is a bridge to our brothers in the Middle East. If the western world is to ever understand the Arabic world, it begins by understanding, and the spice of Morocco is an incredibly colorful place to start. As France struggles with it’s imperial past, and seeks to understand what it’s future is Christian, Jew, and Muslim have much to learn from the gateway to the Sahara. 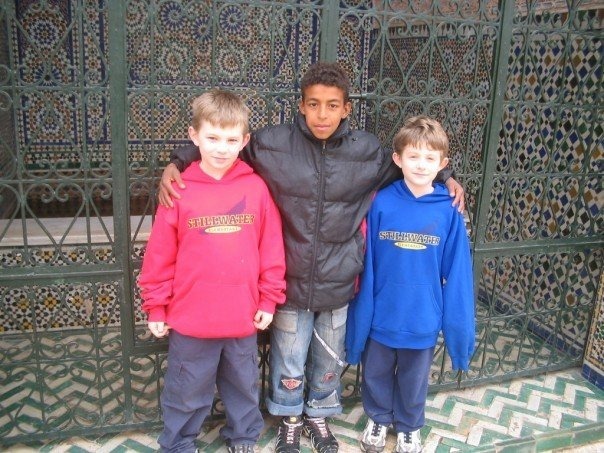 Pictured Above: My boys are getting a personal tour of the mosque from one of the boys of the souks. They didn’t speak the same language, but they did communicate… volumes. loved this! Just completely got lost in your storytelling !